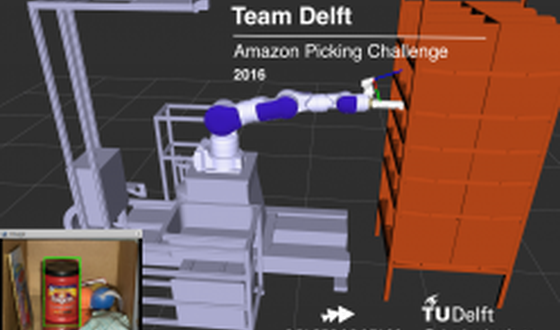 After qualifying as finalists for the Amazon Picking Challenge, it has been a very busy period for Team Delft, now established at their new headquarters in TU Delft /3mE Control Department robotic lab. The global design of the robotic system has been finished, addressing the goal of a robust, modular and flexible pick and place solution, e.g. for warehouses. A 7dof SIA20F Motoman robot arm mounted on a rail was selected and is provided by Yaskawa. The 8-degrees of freedom provide the required maneuverability to reach all locations of an Amazon shelf. This was validated with motion reachability analyses. To identify and locate the target products on the Amazon Shelf, a 3D Ensenso camera – courtesy of Imagining Development Systems – will feed images to a Deep learning vision system. The team is developing its own gripper through quick prototyping and testing. It will use suction for most of the Amazon products, but complementary mechanisms are being evaluated for those of more complex grasping. The ROS-Industrial based software is being developed and integrated in simulation thanks to the available ROS tools. Everything is ready to start testing with the real robot, arriving next week! By the 1st of June, Team Delft will present its robotic system in the Factory-in-a-day booth at Robobusines Europe. The robot will demonstrate its skills for locating and picking items on an Amazon shelf in an exhibition match with the other Dutch finalist, Team Applied Robotics. A month before the Amazon finals at RoboCup (Leipzig, June 28 – July 1), these ‘Dutch’ trials will be a nice test to get ready for the competition, where the team aims to successfully find and pick all Amazon products!